The picture published in August 1945 was one of four frames Eisenstaedt took over the span of a few seconds. The sequence is described in the recently published book, The Kissing Sailor (Annapolis: Naval Institute Press, 2012): "As he overtook her slender frame ... he pulled her inward toward his lean and muscular body." Her initial attempt to resist "proved futile against the dark-uniformed man's strong hold." She instinctively clenched her fist and lifted her arm up in defense. The two embraced; the next frame showed "a mixture of brutish force, caring embrace, and awkward hesitation. "Finally she lowered her left arm "and gave over to her pursuer -- but only for three or four seconds." And then it was over. The two parted, not realizing their encounter had been photographed, let alone immortalized for all time. December 26, 2012 -- Few pictures in history are as enigmatic as the 1945 photo depicting a sailor kissing a nurse in New York's Times Square. 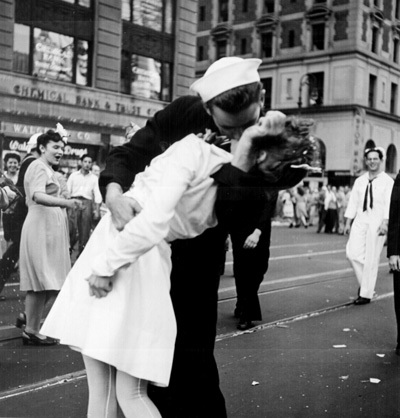 The picture was taken on V-J Day -- Victory over Japan Day, the official end of World War II. For nearly 70 years, the girl in the picture was always presumed to be a nurse. Taken by Alfred Eisenstaedt, the father of photojournalism, the photo was an impromptu affair. dropped on Nagasaki two days later. They were the one-two punch that preceded Japan's unconditional surrender. Photographer Alfred Eisenstaedt is credited with the famous photo that appeared in Life magazine, "V-J day in Times Square." But this version, "Kissing the War Goodbye," was taken at the same time from a slightly different angle by Navy photo journalist Lt. Victor Jorgensen and published in the New York Times. As time evolved, the mystery of who the photo's characters were magnified the importance of the picture. Originally, it had been one of scores published in the August 1945 edition of Life magazine celebrating the war's end. The question of who the couple was became as much a part of the enigma as the photo itself. Over the decades, Life attempted to locate the original characters in the picture, and several candidates came forward. At various times Eisenstaedt, Life, other publications, and several prominent newsmen all declared they had found the elusive couple, but none had.